URGENT ACTION ALERT: Affordable Care Act Repeal is Back! Ending federal protections for those with pre-existing conditions. This is just the tip of the iceberg - there are many other detrimental provisions of this bill. We need to take this seriously and fight back once again. Please join your union brothers and sisters from around the country in urging your Senator to vote NO on the Graham-Cassidy Affordable Care Act repeal bill. The APWU is committed to fighting so that all Americans have access to the highest quality and most cost-effective health care services, regardless of their employment, income, or health care status. There is much work still to be done, but millions of Americans, including our friends, families, and communities rely on the ACA. While we must continue to work towards affordable and quality health care as a right for all, any attempt to repeal ACA takes us in the wrong direction. We have to hold the line. 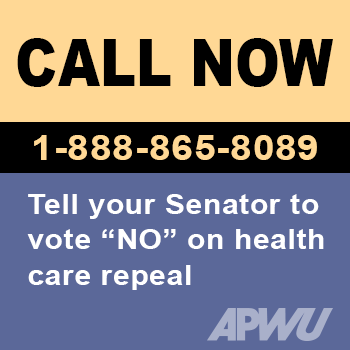 Call 1-888-865-8089 TODAY to urge your Senator to vote NO on the Graham-Cassidy Affordable Care Act repeal bill!